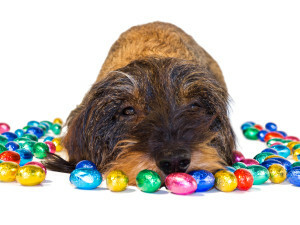 Are You Aware Of These Common Easter Dangers for Dogs? Tasty treats many of us enjoy around Easter time include chocolate Easter eggs and hot cross buns. Sadly, both are poisonous for your pet as they contain ingredients which are toxic to them and could make them extremely ill. Learn more about how these foods could affect your dog and what to do if you think they have eaten them. These tasty fruit and spice buns traditionally eaten at this time of year contain sultanas and raisins both of which can cause kidney failure in dogs. Therefore, please avoid sharing these with them. Some pets can ingest huge amounts of dried fruit and feel no ill effects. Other pets – even large breeds – have found a few raisins can prove fatal. Similarly, grapes, avocados, peaches, plums, macadamia nuts and ice cream are foods you might enjoy but which can be poisonous for your dog. Read our blog on dangerous foods for dogs here. However, the food to be most wary of is at this time of year is chocolate. Chocolate is everywhere in the form of chocolate eggs and figures. They are often in their boxes, half eaten, or waiting to be found. Easily sniffed out by your opportunist pet. Ensure your pets are safely out of the way before starting an Easter Egg hunt, as often they are the quickest to find the treasure and chocolate can be extremely dangerous for your dog. Different dogs react to different things. Some dogs can tolerate human chocolate without apparent illness. Sadly however, most dogs react very badly and for some, it could kill them. Chocolate contains a stimulant called theobromine – similar to caffeine – which is poisonous to dogs. Vets say chocolate is one of the most common causes of poisoning in dogs. It can make them very unwell and often it proves fatal. Dark chocolate contains the most amount of theobromine, whilst white chocolate has very little. Theobromine mainly affects the heart, central nervous system and kidneys. Symptoms will occur from 4-24 hours after your dog has eaten chocolate and will vary depending on the amount of chocolate – and therefore theobromine –your dog has ingested. If your dog has eaten any chocolate contact your vet as quickly as possible with as much information as you can about how much they have eaten and the type of chocolate consumed. Keep the chocolate wrappers and remains of the chocolate and take them with you to the surgery. There is no antidote to theobromine. In most cases of chocolate poisoning, your vet will initially make your dog vomit, wash out their stomach and then feed them activated charcoal to absorb any theobromine left in the intestine. Please do not be tempted to make your dog vomit yourself. This should be done by your vet in a controlled manner. Please note that not all pets react the same way to poisoning and some appear to tolerate grapes, raisins, chocolate etc. with no apparent ill- effects – there is no way to predict the effect these foods will have on your dog and so it is always best to avoid them. If you think your dog has eaten chocolate, even if they do not appear to be having any adverse reaction, always contact your vet for their advice. The sooner they are seen the better their chance of survival. With poisoning, it is extremely common that the reaction does not occur for many hours or even days after ingestion and by that time it could be too late. Dogs can be poisoned by eating spring bulbs when they begin to flower. As a precaution, keep bulbs in a sealed container only removing them individually when you are ready to plant them. Keep a close eye on your pet and your garden, so you can quickly spot if they may have dug one up and tried to eat it. Daffodil bulbs – look out for signs of poisoning such as vomiting, stomach upset or drooling. Dogs can also appear drowsy, unstable or collapse. In severe cases, heart rate, blood pressure and body temperature can all be affected and in some cases, causing fits. Dogs can also be affected in a similar way, if the daffodil flowers are eaten, or even from drinking water from a vase of daffodils. Tulip bulbs – contain toxins which irritate the mouth and gastrointestinal tract. Your pet may drool, vomit or have diarrhoea. In rare cases serious problems such as heart issues and breathing difficulties can occur. Hyacinth bulbs are similarly toxic to your pets. Spring crocus – the bulbs that flower in spring are thought to be less poisonous to dogs and could potentially cause only mild stomach upset if eaten. First Aid for Pets provides this information for guidance and it is not in any way a substitute for veterinary advice. The author does not accept any liability or responsibility for any inaccuracies or for any mistreatment or misdiagnosis of any person or animal, however caused. It is strongly advised that you attend a practical First Aid for Pets course or take our online course to understand what to do in a medical emergency. Learn step by step how to help your dog when it matters most! 100% FREE, no credit card required! Thanks! Please check your email for your login information!